This series for band contains five different student books and plenty of supplemental materials. 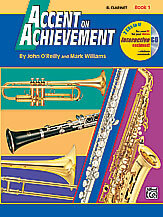 Accent on Achievement, Books 1 & 2 contain lesson materials that teach your beginning students how to play their instruments. Book 3 is arranged by key signature and features exercises and chorales in 12 major and 12 minor keys. Accent on Ensembles contains duets, trios and quartets playable by any combination of instruments. Accent on Achievement, Book 1 - Unique Features *5 full-band arrangements *Solo with piano accompaniment *22 different classical composers *49 folk songs from 19 countries *Chorales in the keys of Concert B-flat, F, E-flat and A-flat *6 creativity exercises (composing and improvisation) *15 duets *2 pages of rhythm clapping exercises *2 pages of exercises for rests *Scales & thirds in 4 keys *7 technical exercises plus 2 additional pages! *8 theory exercises.